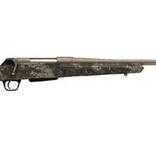 WINCHESTER XPR HNT STRADA 6.5CM 22" - Corlane Sporting Goods Ltd.
Winchester XPR Strata Camo 6.5 Creedmoor 22"
Home / Winchester XPR Strata Camo 6.5 Creedmoor 22"
Affirm your position at the top of the food chain. The Winchester XPR rifle is a step forward in design and manufacturing bringing you a high-performance hunting rifle at an extremely affordable price from a name you know and trust. Pairing the performance of the XPR with True Timber's Strata camouflage pattern gives you a lethal advantage.